I send my greetings to you militant workers of Haft Tapeh and the steelworkers of Ahvaz. Your steadfast strike and struggles echo the demands and sentiments of all the workers and people of Iran. The methods of your struggle are methods that can become a blueprint for all the workers and people of Iran. You are demanding the payment of unpaid wages, you have come out against poverty and corruption, you are calling for workers to get organised and take over the running of their affairs. These are the sentiments of the people of Iran, the sentiments of the working class in Iran. The methods of your struggle can become a model for all workers and various protest movements in society. Your families have joined your struggles and doubly strengthened your fight. By holding general assemblies and organising your struggle on a workers’ council basis, in my view you have taken a huge step forward; you have raised the banner of workers’ councils and have demanded the direct exercise of the will of workers through their council. This is a demand, slogan and aim of the whole workers’ movement and the people in Iran engaged in protest. On the other hand, the unity and solidarity that you have shown between the two sectors of workers, i.e. the steelworkers in Ahvaz and the sugar cane workers in Haft Tapeh, if not unprecedented, is exceptional in the history of the workers’ movement in Iran. It is over three weeks, nearly a month, now that two important sectors of workers have been on strike and during your strike you have come out united and in solidarity with each other and in support of each other’s demands, slogans and struggle. This solidarity can be widened to include larger sections of the working class in Iran. The government, faced with this powerful wave of your struggle, has no choice other than, like always, to resort to threats, repression and prison. But, as you have said in your slogans, even threats, repression and prison have no effect, and have only led to the strengthening of your struggle. It has been reported that Ali Nejati [the head of the union of sugar cane workers] and also his son Peyman Nejati have been arrested, while their house was raided and they were brutally beaten up. It has also been reported that Esmail Bakhshi [a popular leader and representative of the sugar cane workers] has been subjected to torture and physical abuse in prison. This outrage should be answered firmly, and we should stand up to these savages, demanding the immediate release of Esmail Bakhshi, Sepideh Gholiyan, Ali Nejati and Peyman Nejati; an urgent demand that should be forced onto the government. 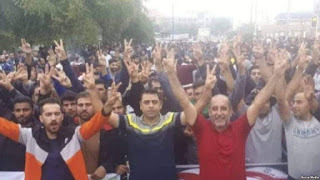 Up to this point, your struggle and the demand for the release of Bakhshi has given rise to a huge wave of support, both in Iran and internationally. 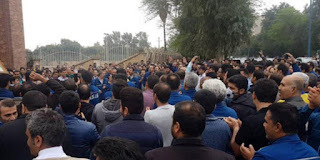 Workers’ organisations, workers’ rights personalities, writers, students, retired workers, teachers and civil rights activists and figures have started petitions and issued statements and held protest gatherings to call for the immediate release of Bakhshi, and actively supported your struggle. 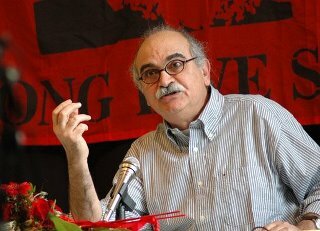 Also, internationally, many trade unions, in Europe and Canada, have called for the release of Bakhshi and supported your struggles. This wave of support must be extended further, and the Islamic Republic forced to release Esmail Bakhshi, Ali Nejati, Peyman Nejati and Sepideh Gholiyan immediately and unconditionally. This fight must be continued until the release of all jailed workers and all political prisoners in Iran. In the hope of victory and success!